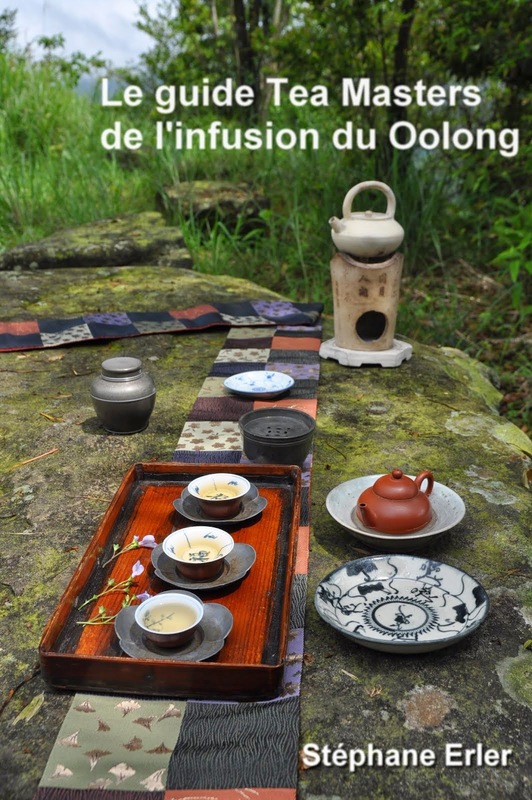 The first obvious trick is to transform green in black pu er by fermenting the cake at full speed, that means with lots of water and at high temperatures. Methods vary. It can be done by the producer with his tea before pressing it to a cake or by the middleman who sprays water on the face of the cake to let mold appear within a week. Then, the forger will make the wrapping paper look older and worn off. Printing the same characters is the easier part. Some sun tan and rough handling in a cool dryer will make the paper look old, I guess. But how about the little holes in the paper? Teaparker told us this secret too: spray some water mixed with a little sugar on the paper and place it where some ants pass by. Within a few days they will have completed the job. The older you want it, the more sugar you add. Et voilà! But there is one thing the forger have not paid much attention, yet. It's the bamboo leaves that wrap the qi zi bing, the seven round pu er cakes. 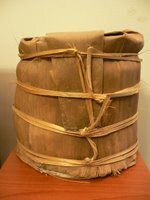 Teaparker showed us a picture of a real 80 to 100 year old pu er package. -It belonged to a very old Chinese who had already passed away. The tea was not for sale and the person was not a tea merchant. This makes is credible.- What we noticed is that the bamboo leaves also presented signs of aging. Like the wrapping paper, they too started to be 'bitten away' by time. But what was more striking was their color: gold brown, like what one expects old wood to look like. They were shining under the sun as if they had been polished! 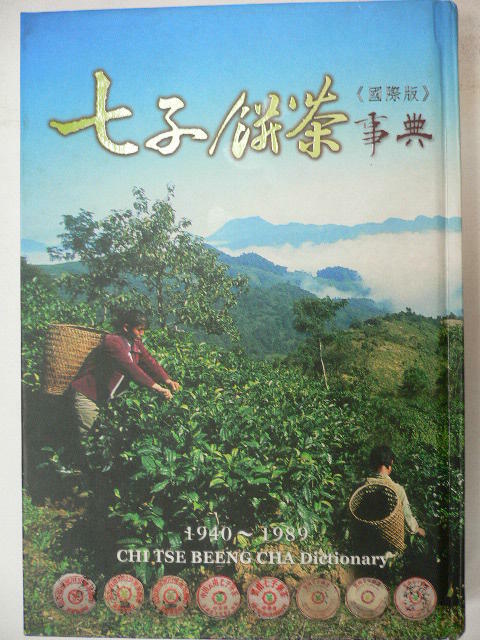 The whole lesson became even more interesting when he then took a taiwanese book about old pu er. Here were pictures of pu er claiming to be 40, 50, 60 years old. More interesting then the tea itself was the picture of the bamboo leaves. 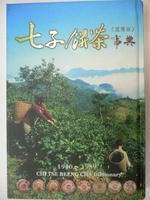 The tea did look old, but the bamboo leaves looked as young as the leaves from this 2001 chi zi cakes. So, another way to authentify an old pu er cake (except using Carbon 14) is to look at the bamboo leaves containing the cakes. I hope this trick stays between us. 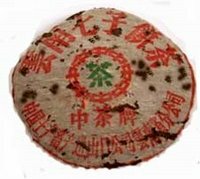 Don't tell the seller of fake old pu er how you saw it's fake! Just walk away grcefully! Even if he's also a victim of his supplier, he might complain to him and pass the information to the forger. They would then age the bamboo leaves too! ps:: i prefer english but if you write in chinese it is ok too. Once again, we have come to the rescue.... What a great post for all new pureh / black tea collector. I have looked at your pictures of Lui An and must say I find the bamboo leave of the '30 years' old Liu An quite green for such an age. And the color of the basket of the wrapped basket seems quite close to the other... which also doesn't make sense. But pictures are very much influenced by light and it's very hard to tell from them. I gave you some keys in this article to identify potential signs that fakers forget to change. The other thing that you alone can do is taste the tea! Does it taste as good as it should after such long natural aging. Don't be afraid to open the basket. For one, air will help eliminate bad smells. Make sure, for instance, to flake the tea a few days before you drink it. 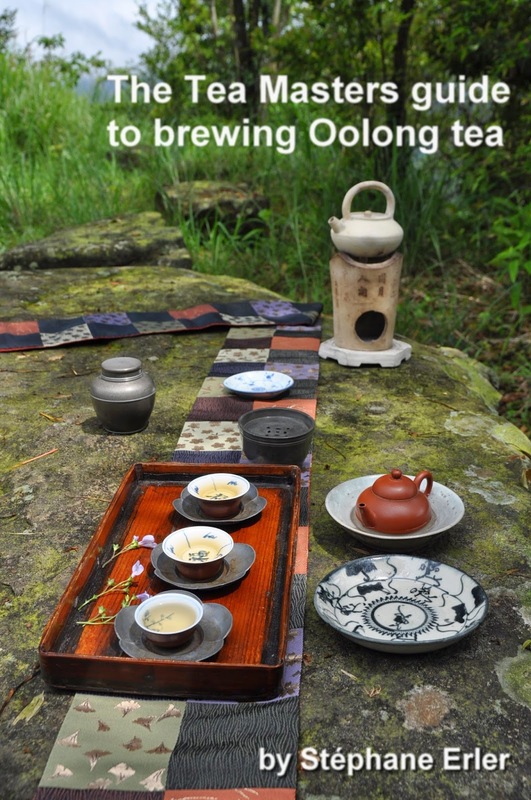 For your first try, take just one or 2 gramms and brew it in a gaiwan. With such a small quantity, it's not like you're wasting precious and expensive tea, it's your quality control to know for sure that you have an Opus One or Chateau Margaux in your tea cellar. And this is an advantage tea has over wine: once open, you don't need to finish it within 48 hours!